Please allow seven (7) days for UK delivery during peak postal time. There is no dispatch or delivery on UK bank holidays or weekends. Please note that delivery is by Royal Mail therefore neither SK Chase nor Hilton Dunkeld House can be held responsible for delays caused by the postal system. We accept no liability for any delay which may occur in the delivery times which are due to circumstances outside their control. You may cancel an order in such circumstances. To cancel your order, please contact SK Chase at enquiries@skchase.com or by phone at 0344 371 0071. Please see 'What delivery option should I choose?' (above) for more information on delivery options. • you told SK Chase (or Hilton Dunkeld House) beforeHilton Dunkeld House accepted your order that delivery within the delivery deadline was essential. If you do not wish to cancel your order straight away, or do not have the right to do because the above do not apply, you can give SK Chase (acting as Hilton Dunkeld House's agent) a new deadline for delivery, which must be reasonable, and you can cancel your order if the new deadline is not met. If you do choose to cancel your order for late delivery and you have ordered more than one gift voucher, you can cancel in respect of one gift voucher or all of the gift vouchers, unless splitting them up would significantly reduce their value. After you cancel your order SK Chase (on behalf of Hilton Dunkeld House) will refund any sums you have paid to SK Chase for the cancelled gift voucher and its delivery. This refund will include the delivery charge paid by you (providing (i) you have cancelled your order within the Cancellation Period; or (ii) the gift voucher is faulty or mis-described, in which case SK Chase (on behalf of Hilton Dunkeld House) will refund the delivery charges (if the postal delivery option was chosen). In respect of a refund of the delivery charges paid by you, the maximum refund will be the costs of delivery by the least expensive delivery method we offer (the cost of UK First Class post). If you have already received the gift voucher which you have cancelled, you should destroy it. If SK Chase finds, after SK Chase has received your notice of cancellation, that the gift voucher has been used you shall not be entitled to a refund. 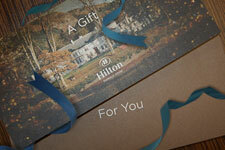 It may be possible for us to extend the validity of your gift voucher, however we cannot guarantee this. Please contact Hilton Dunkeld House directly to check if it can offer an extension. VAT receipts can only be issued by Hilton Dunkeld House, as you have purchased one of their gift vouchers, and not an SK Chase voucher. If you require a VAT receipt please contact Hilton Dunkeld House directly to request this.